Autumn is open us and though the amazing autumnal colours haven't reached their peak yet in Devon, the nights are closing in rapidly. During the spring and summer months my photography benefits greatly from the long evenings. Photography during the week becomes practical as I can grab my camera and head out straight after work and travel all over Devon and Cornwall and still make sunset. Over the last few weeks though that window of opportunity has been shrinking and my ability to travel long distances before sunset reduced. So when I was looking at my location map and decided to go to The Valley of the Rocks, I knew this could be one of the last of my longer mid-week trips for a while. With my one location locked in for the evening I got to checking out the conditions and planning my shoot locations (see my blog post on Planning). 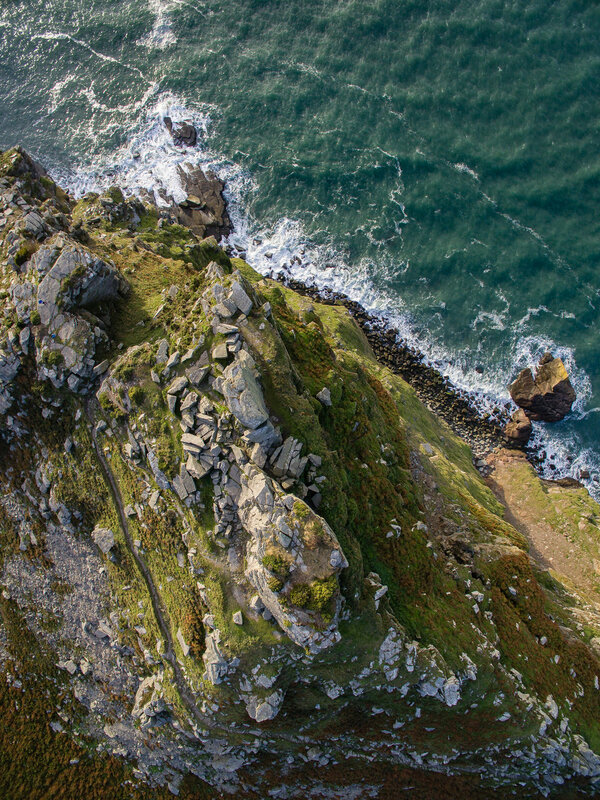 On my last visit to The Valley of the Rocks I took some time to have a walk about to see if I was missing anything. (Check out my blog post on Location Scouting to read why I do this). Well, I was glad I did as I discovered a whole new aspect to The Valley of the Rocks and was inspired with some new ideas! My plan was to not only take out the big guns (Nikon D750) but to also take out my DJI Phantom 3 4K so that I could get some aerial shots of the dramatic coastline and rock formations. 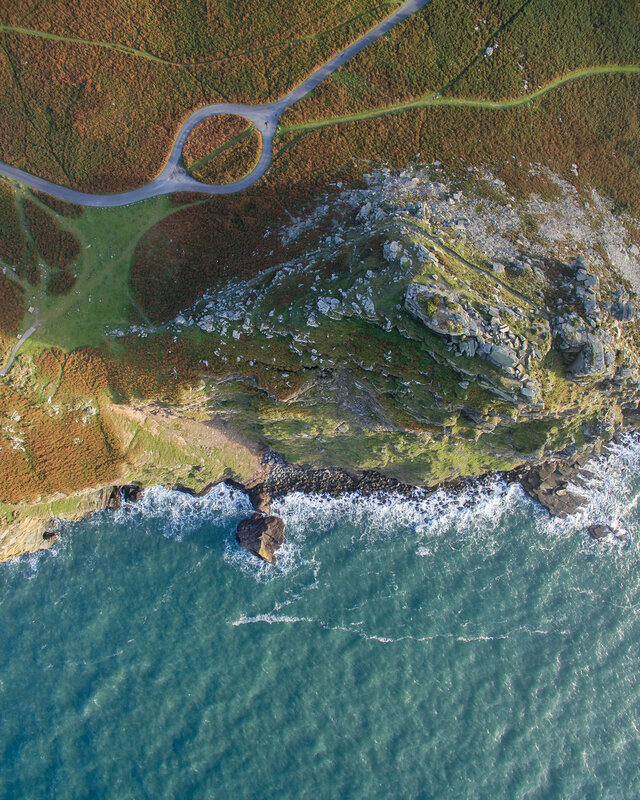 I've recently been discovering the joys of drone photography and I thought this would be an ideal opportunity to do some more work in that area (see blog post on Drone Photography). My plan was to shoot with the drone while the light was good, and then switch to the DSLR for last night. So with my one location locked in and my two camera's packed I set of for the north coast of Devon. The drive to my location wasn't exactly inspiring as the rain continued to come down and as I reached some of the higher parts of the route the fast moving cloud got lower and lower. However, I had checked the weather forecast and it had promised to clear up around sunset so I was remaining optimistic. By the time I had got there things had much improved so with a sense of excitement I got to my first spot and got the drone out. It was at this point that I did get a little nervous. If anyone has been to the north Devon coast will testify it can get a little windy. 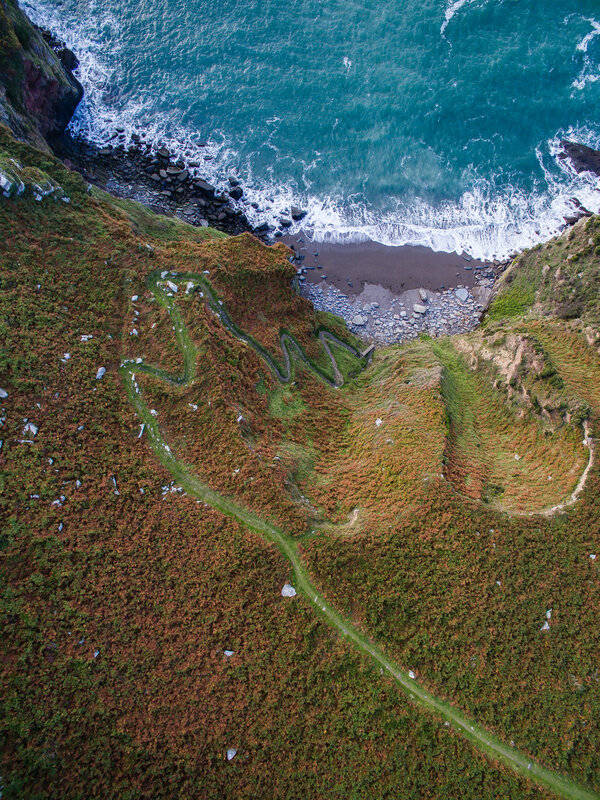 I've had to extend my planning routine recently to take into account flying the drone, particularly along the coast. I now check the coastal weather forecast to see how strong the wind will be. The drone does have a maximum horizontal speed and flying in wind speeds that exceed that could see my drone drift out to sea! I had done a number of calculations and worked out that I could safely fly it in the predicated conditions of a force 4 wind. However, what is OK on paper may not actually be OK in real life. So while perched on a cliff side with a very long drop I cautiously started up the drone. Hovering at 1.5m I could see the drone working hard to stay in one place. Putting caution to the wind (excuse the pun), I decided to fly it away from the cliff side as I thought it might be a bit less blustery. Though the drone was still working hard, it had settled down a bit and my confidence grew. I still had a worry that it was going to get caught by a gust of wind and go out to see or crash into a cliff, but I was feeling bold (or daft) and managed to capture some dramatic images. After about 45 minutes with the drone I had got the images I had come for. Well, most of them anyway. There were a few shots of some rock arches that I wanted but I really wasn't brave enough to get them given the conditions! So with sunset approaching rapidly I headed off to a spot that I had noticed earlier with the plan of shooting Ragged Jack with my DSLR. As it was a Tuesday evening in late September I thought I might have the place to myself but as I turned the corner I found another photographer setting up on the cliff side. The spot we had both picked to shot was relatively small but Steve (the other photographer), kindly let me share it and we got chatting. It was the normal stuff, gear, technique, processing, but all very enjoyable! Just as we got shooting another photographer turned up. So two became three and we all waited for that magical sunset moment….which to be honest never actually happened. I took a handful of frames trying different combinations of filters but sometimes the conditions just aren't quite right. The third photographer soon walked on and I continued to enjoy my chat with Steve. We both continued to take a few frames but soon we were packing up also. Though my final image taken with my DSLR isn't one for the portfolio I still count my trip to The Valley of the Rocks as a success. Firstly I managed to capture some nice images of the location with the drone. I really like the extra dimension that the drone has brought to my photography. I try and take the same approach to composition with the drone as I do with the DSLR, but this doesn't always work so I'm still learning how to compose when shooting at 200 ft! It's also good to just get out and practice the art of photography (see my blog post on Practicing). Sure the conditions didn't turn out to be perfect but just getting out with the camera is always a pleasure. It is the unexpected that can also make these trips worthwhile. It was great to meet and chat to a fellow photographer. Landscape photography can be a solitary pastime, and while I greatly value the solitude, it's also great to meet people, especially other photographers. So overall it was time well spent. Any time with the camera is time well spent! I might still squeeze in a couple of mid-week evening shoots but I'm already starting to plan out my dawn shoot locations for the next few months. During autumn and winter my opportunities for photography are limited to weekends and sunrise shoots minimise any impact to my family commitments. But do you know what, I kind of like those cold mornings perched on top of a tor on Dartmoor, freezing cold, drinking coffee, waiting for the sun to rise and bath the world in light.